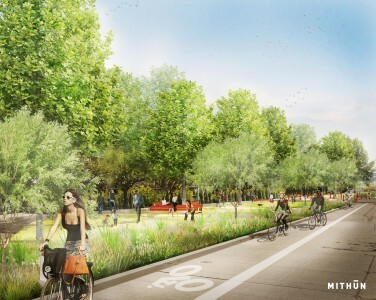 The 14th Avenue Northwest Park Boulevard project converts four blocks of an existing concrete roadway and gravel parking median to a linear park complete with recreation areas, dedicated bike lanes and a rain garden. The linear bioretention swales provide water quality treatment and conveyance while separating the active pedestrian space from bicycles and cars. Construction was completed in 2018. Mayfly managed the civil engineering aspects of the project, providing stormwater options analysis, transportation design, stormwater modeling and street improvement plan production.